The NBA's website says Lucky, the Celtics' mascot, "swears he'll remain the No. 1 fan for his favorite team until the end of time." Or until time runs out. 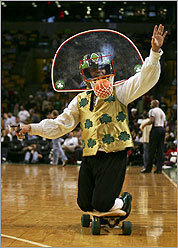 Damon Lee Blust, the gymnast who plays the acrobatic leprechaun, has parted ways with the Celtics. According to a statement released last night by his agent, Blust and the Celtics "mutually agreed to relieve Damon from his contract as the team's mascot for the remainder of this season and next." The Celtics also issued a statement yesterday confirming that Blust is no longer employed, but a spokesman refused to elaborate. "We appreciate his many efforts in entertaining Celtics fans as well as his work in the community while a member of the Celtics organization," the statement reads. Celtics president Rich Gotham declined to say whether Blust quit or was fired. "It's a private employer-employee matter, something I can't talk about right now," he said. The team also declined to say whether or when Blust might be replaced. Scott Jordan of (207) Entertainment in Portland, Maine, who recently began representing Blust, said Blust was not fired. In his statement, Blust said he will miss performing for "the best sports fans in the world," as he has for the past six seasons. But he said leaving would allow him to launch a new career working with children on health issues. "At 33, I'm not getting any younger and like most professional athletes there comes a time to step out of the limelight and focus on a career that can be sustained at an older age." Blust said he plans to create a school-based health and fitness show focusing on preventing diseases such as Type 2 diabetes among youth. "The only way I could repay the Celtics for their support over the years is to take what I've learned from the organization and strive to provide the same level of excellence . . . with my own school program," he said. He signed his statement, "Go Celtics! Best o'luck, Damon Blust aka Lucky." But a source in the Celtics organization said Blust had been having trouble with management, and had missed public appearances for both charities and Celtics sponsors, despite warnings to change his behavior. "They sat with him before the season started and told him, 'If you don't show up, there are going to be problems,' " said the source. "He wasn't keeping his schedule like he should have." Blust, who became the Celtics' mascot in 2003, is a skilled gymnast who often dunked after catapulting off a trampoline. He was a familiar sight at TD Banknorth Garden in his velvet knickers, vest, bow tie, and bowler. Celtics fans either loved him or hated him. "Red [Auerbach] must be lighting a cigar in heaven right now," one fan posted yesterday on Boston.com. "Lucky was [and will be when they replace him] the height of the tacky game 'presentation' that is such a part of today's NBA." Others expressed sadness at Lucky's departure. "As a season ticket-holder, I like having him around," wrote one man. "He was always running around, shaking hands with the little kids, silly stringing anyone in the stands with opposing jerseys. Don't know anything about him off the court, but hopefully they will find a replacement ASAP." Blust, who said he was the first unmasked professional sports mascot, told the Globe in 2006 he was to the role born. "Big nose, gapped teeth - I was Lucky," he said. "God really knew what he was doing that day." Blust had undergone surgeries over the years for various injuries. Blust, who lived in Quincy until recently, when he moved to New Hampshire, was also fined $200 last month for speeding and driving with a suspended license. Mike Rotondi, a season ticket-holder for 30 years, was saddened by Lucky's departure. "I thought he did an awful nice job, and it's tough," said Rotondi, who lives in Hingham. "You've got to run around and wear a silly little outfit and he did it very well and he did it with a smile on his face." Rotondi said he often spoke with Blust, who seemed enthusiastic about his job. Rotondi recalled one stunt in which Blust shot himself out of a big slingshot that propelled him down the court on roller skates. "He went at about a million miles an hour, hit a ramp, did a flip, and put the ball in," Rotondi said. "He hurt himself a couple of times. To me, he was a very, very nice guy, and I thought he was very good, especially for the younger kids." Joanne Borzakian Ouellette, who has had front-row season tickets since 1974, once hired Lucky to entertain at her son's birthday party. "Lucky was fun to watch, especially for the children," said Ouellette, of Westwood. "I think he added a fun element." Rotondi believes it will be difficult to find another Lucky. "I don't know how the heck they're going to find someone to replace him," he said. "Who wants to put their body through that? Not me. I get sore just watching him."